April 9, 2019: It was almost an out of body feeling pulling into the Maryland Soccerplex on the fourth day of March this year. I’d played there probably a hundred times during my youth soccer days, including a National Championship. Yes, Maryland Soccerplex was about as close to a home field as I had back then, but now, it felt strangely foreign. You see, on March 2, 2009, the Washington Freedom released their Preseason Roster. 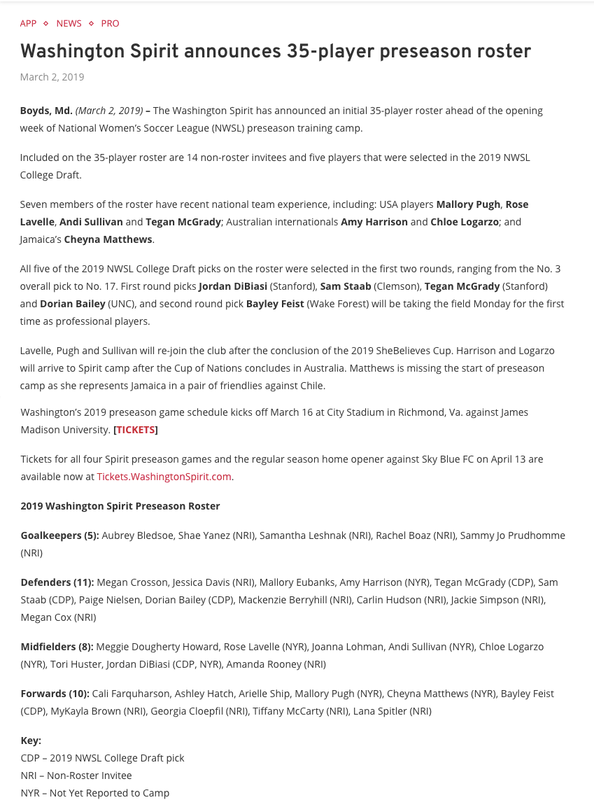 Ten years later, to the very date, March 2, 2019, Washington Spirit released theirs. There are only two names that appear twice, and those are mine and Joanna Lohman’s. Things could not be more different between then and now. In 2009, I was 21 and a college senior at Penn State. I showed up to preseason terrified, and marking Abby Wambach didn’t help ease my anxiety much. In 2019, I’ve got a decade of experience under my belt, both on and off the field. And with that experience comes a completely new perspective. I was no longer intimidated by the stars on the roster, and in fact, I was so excited to see how I would stack up against them. In ten years, I’ve come to terms with my shortcomings in my game, and I know how to work around them. I’ve developed a bigger voice, more confidence and honestly, I’ve never felt better physically. I’ve received so many messages of support. Friends, coworkers and family have checked in religiously to ask how things are going, and now that I have had a couple weeks to distance myself from the experience, it’s time to share the story.... Read more!